Can SolarCity do for energy storage what it has done for solar power? SolarCity is getting into the commercial energy storage business by installing and financing batteries and smart software behind the meter. That could be good news for manufacturers, retailers, and other businesses or schools which can gain more control over their electricity bill. It's not such good news for smaller competitors such as Stem, Solar Grid Storage, Silent Power or Demand Energy. It's also a crash course in grid edge reality as consumers take a more active role in their energy usage and continue to challenge the traditional utility-customer dynamic. SolarCity has already made a foray into residential solar combined with energy storage -- now it expects to build and finance 30 to 50 commercial solar-battery systems next year. We spoke with Eric Carlson, Senior Director of Grid Systems Integration, along with SolarCity's Jonathan Bass. 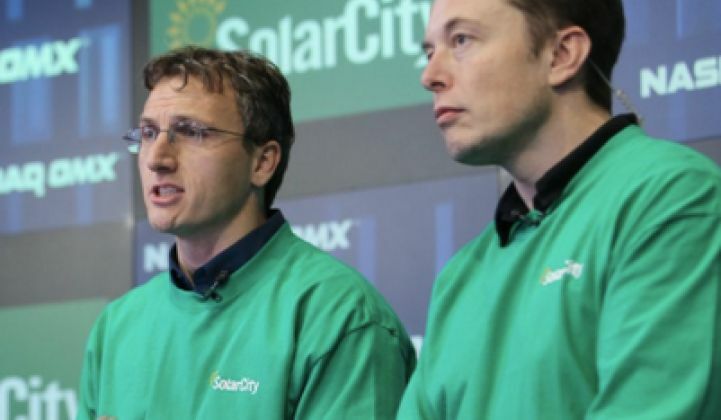 The duo noted "the software legacy" of SolarCity being combined with what Bass called "the world's most advanced battery pack" from Tesla Motors. 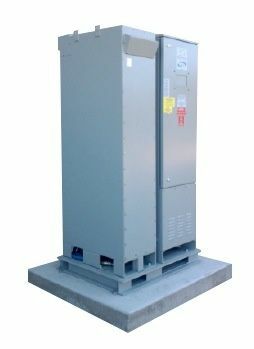 As with most commercial storage applications, the system addresses demand charge management, reduces peak demand, and provides emergency backup power. Energy storage could potentially integrate with utility demand response programs, engage in permanent load shifting, and cope with EV charging demands. Hurricane Sandy changed the public's perceptions about grid reliability and disaster readiness: building owners are much more willing to pay for crucial services in the event of a power failure. They want to be able to pump water up to gravity feed tanks and run a service elevator for a few hours. A 200-kilowatt/2-hour battery can do that. The commercial systems from SolarCity are provided with no upfront cost through a ten-year service agreement, along with lower energy costs from day one, according to the firm. The system requires no behavioral or operational changes by the business and can power "IT functions, security systems, cash registers and other critical business systems during power outages," according to a statement. All systems are tied to a central operations center. Peter Rive, SolarCity's CTO and COO, said, “Utilities have altered their rate structures such that demand charges are rising faster than overall energy rates, and businesses are bearing the bulk of those increases.” The company claims that its system "automates the discharge of stored energy to optimize utility charge savings for customers." The commercial lithium-ion battery systems are sized according to the customer's usage patterns, with the smallest modular unit at the size of "a small refrigerator." The system can be installed indoors or outdoors and ranges from tens of kilowatts to hundreds of kilowatts with a minimum of two hours of duration. Typically, the storage system is sized at about 30 percent the size of the solar installation. SolarCity claims, "Some utilities are basing rates less on the overall amount of electricity consumed, and more on 'peak demand,' [which is] the maximum amount of electricity used at a specific point in time. Solar power can significantly offset the overall amount of electricity used by organizations, but if an organization’s 'peak' electricity demand is still high during the day -- in the late afternoon, for example -- the organization can be hit with high demand charges. SolarCity’s commercial storage system regulates the amount of electricity that organizations need from the grid during 'peak' periods, reducing exposure to exorbitant demand charges." Energy storage of this nature works best in regions with high demand charges or complex rate structures. SolarCity's storage system, always in tandem with solar, will be offered in regions of California serviced by PG&E and SCE, areas of Massachusetts serviced by NSTAR, and areas of Connecticut served by Connecticut Light & Power. SolarCity's announcement comes at a peculiar time for energy storage in the Golden State. While utility-scale solar is being looked at carefully in California because of a 50-megawatt mandate for SCE and a 1.3-gigawatt mandate in the state, it is also getting some pushback by the large investor-owned utilities (IOUs). As Jeff St. John just reported, California's state regulators are looking to resolve a conflict between the state’s big three IOUs and commercial customers that want to add batteries to solar PV systems. It's a conflict holding back the progress of more than 300 solar-storage projects that would add up to 10 megawatts of capacity. The IOUs are looking to block solar-storage projects that seek to interconnect to the grid under the state’s net metering program. St. John reports, "Since this spring, those utilities have been requiring any net-metered solar power projects that include batteries to go through a lengthy and expensive process to prove their batteries aren’t feeding stored grid power back to the utility, while getting credited for delivering green, solar-generated electrons." The IOUs are making the case that consumer energy storage can game the system and threatens net energy metering (NEM). St. John writes, "It’s too early to know whether the CPUC will side with solar and energy storage advocates on this issue. But [CPUC Commissioner] Peevey’s ACR lays out several points that seem to indicate that he’s not persuaded by the utility argument that storage-backed solar represents a threat to net metering, or that the additional steps utilities are requiring for these systems are reasonable." It comes down to metering the storage devices appropriately. Carlson of SolarCity notes that under the current tariff, there is a specified way of metering systems when solar is deployed along with other devices. Different metering is required when there is a shared inverter as opposed to when there are two separate inverters. It appears to be a solvable engineering and regulatory problem. In any case, California leads the nation in energy storage legislation, mandates and goals, while SolarCity and the other behind-the-meter storage vendors are testing the current limits of how energy storage can be deployed on the grid edge.